2 x Jim Beam Heavy Rocks Glasses. Condition is New. Dispatched with Royal Mail 2nd Class. A brand new Jim Beam Kentucky bourbon whiskey glass. Standing 12cm tall with a 8.1cm circumference and weighing 0.354 kg. This stunning round top hexagon bottomed glass has the Jim Beam name and logo in the centre in Red, White and Gold and the Jim Beam logo embossed in the base. This stunning glass would enhance any bar, collection or make a super gift. Will dispatch immediately and contents will be secured safely. Genuine Jim Beam Bourbon Whiskey Glasses in excellent condition. Heavy square base and etched with the Jim Beam logo. Brand new Jim Beam Kentucky bourbon whiskey glass. Standing 12cm tall with a 8.1cm diameter and weighing 0.354 kg. These stunning round top square bottomed glasses have the Jim Beam name and logo in the centre and the Jim Beam logo embossed in the base. This stunning glass would enhance any bar, collection or make a super gift. Will dispatch immediately and contents will be secured safely. Pair (2) of Jim Beam tumbler glasses. Jim Beam logo embossed on the front of glass. About 13cm tall each. Top is circle, base is square. nd Class to 1. They have a heavy Base and are just waiting for a shot of your favourite tipple. For a Gift idea, send a gift which shows how much you care. 1 (One) x Jim Beam tumbler Hi Ball Tumbler glass. Jim Beam logo embossed on the front of glass - See Picture. Unusual Shape. Top is round, base is square. 2 (Two) x Jim Beam tumbler Hi Ball Tumbler glass. Jim Beam logo embossed on the front of glass - See Picture. Unusual Shape. Top is round, base is square. 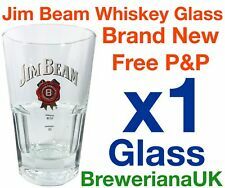 2 x Brand new Jim Beam Kentucky bourbon whiskey glasses. Standing 12cm tall with a 8.1cm diameter and weighing 0.354 kg. 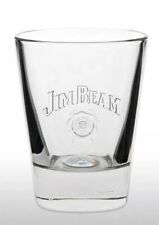 These stunning round top square bottomed glasses have the Jim Beam name and logo in the centre and the Jim Beam logo embossed in the base. This stunning glass would enhance any bar, collection or make a super gift. Will dispatch immediately and contents will be secured safely. Embossed Jim Beam glasses by Rastal. 2cl and 4cl markings on back of glass. Dimensions 8cm diameter 10cm tall 2 Rare Jim beam Make History Silver Pewter Cup Wentworth.. Condition is Used. Dispatched with Royal Mail 2nd Class. Jim Beam Highball glass, good condition 16cms tall. Jim Beam Whiskey Glasses x 2 Jim Beam Heavy Base Rastal Glasses 34cl 13.5cm Tall. Embossed Jim Beam glasses by Rastal. These have Make History embossed on the bases of glasses. Height 13.5cm x 8cm approx. 2016 JIM BEAM 29CL TUMBLER GLASS. JIM BEAM TUMBLER. Has Jim Beam, The Logo and His Signature Embossed into the Front of the Glass. JUST OUT NOW FOR JIM BEAM PROMOTION. This Glass is New and Unused Condition. Embossed Jim Beam glasses by Rastal. These are signature embossed on the bases of glasses. Height 11cm x 8.5cm approx. Top quality glass made by rastal. OPIHR Gin Cocktail Shaker. Jack Daniels Glass. Make History. Text on the glass Carling Pint Glass. Skull Glass. GIANT Beer Glass. The Jim Beam logo is embossed on to the front. This is a very solid impressive glass. Superb glass for adding to a collection or just for drinking from. 2 x brand new Jim Beam Kentucky bourbon whiskey glasses. Standing 12cm tall with a 8.1cm diameter and weighing 0.354 kg. This stunning round top hexagon bottomed glass has the Jim Beam name and logo in the centre in Red, White and Gold and the Jim Beam logo embossed in the base. These stunning glasses would enhance any bar, collection or make a super gift. Will dispatch immediately and contents will be secured safely. 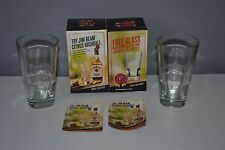 JIM BEAM BOURBON GLASS - set of 6 - Brand new Condition is New. Dispatched with Royal Mail 2nd Class. 6 X 29cl Jim Beam Glasses. On trade so not normally available to buy in store. They have 2cl and 4cl marks on the rear. The perfect addition to your glass collection or a fantastic unique gift! It is important to us that you receive your order in perfect condition. 2x Jim Beam Tumbler Glass Heavy Mixers Glasses Tall Hi Ball - BRAND NEW . Condition is New. Dispatched with Royal Mail 2nd Class. 2016 JIM BEAM TUMBLER GLASS. JIM BEAM TUMBLER. Has Jim Beam Make History Embossed into the Front of the Glass. This Glass is New and Unused Condition in its Box. The Glass Stands Approx 5.25" Tall. JIM BEAM Honey. Condition is New. Dispatched with Royal Mail 2nd Class. Clear glass shot drinking vessel. Boot shaped JIM BEAN engraved. Jim Beam Highball Tankards x2, New. Great Gifts for a JIM. Jim Beam Highball Tankards. New~x2~Glass. Jim Beam Hi-Ball Glasses x2 NEW. Great Gift for a JIM. Jim Beam Glasses, NEW x2.